Provide comfort for the family of Margaret Miller with a meaningful gesture of sympathy. Passed away peacefully at Revera Bough Beeches Place in Mississauga, Ontario on Tuesday, April 9, 2019 at the age of 88. Beloved daughter of Beatrice May nee Gledhill (1988) and John William Martin (1972). Loving wife of George Vernon Miller (1982). Predeceased by her only elder sister, Dorothy May Jeffries (2005). Survived by her cousins in St. Thomas, Ontario and Yorkshire, England. Margaret was a former public school teacher and Ontario Government clerk and lifetime member of Hillcrest Christian Church (Disciples of Christ). Margaret was the youngest daughter of John William Martin and Beatrice Mae Gledhill, born in Toronto, raised on Salem Street. Toronto, near Casa Loma. Her parents as youngsters had immigrated to Canada from Yorkshire England to work in the woolen mills in St Thomas, Ontario before moving to Toronto. At Bathurst and Vaughan in Toronto, the family devoted much of their time both before and after the war to Hillcrest Disciples of Christ Church where her parents, Margaret and her sister Dorothy were married. There are no surviving children. Margaret attended Oakwood Collegiate. She went on to become a public-School teacher and an Ontario Government Librarian. She had been a student at Queens University to maintain her teaching credentials. Margaret and her husband bought a home in 1965 and settled in Mississauga where they enjoyed a wonderful life together. She would stay at their home until sometime after Vernon’s unexpected passing.She loved working in her garden, enjoying roses, mall bulbs, tree leaves and bird watching. She attended many meetings of the local horticultural society exhibiting the best from her home garden and walked many miles on society garden tours. She enjoyed reading her Bible, poetry and hymns. Margaret liked to travel and toured England and Scotland, Australia and New Zealand, taking many photographs. Margaret assisted her elderly church friends and took great delight in being of assistance to them in any way she could. 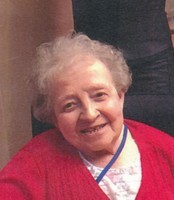 Margaret loved her sister Dorothy and would travel regularly to care for her. Dorothy was seven years older, a retired church missionary of the 1950s, then residing in Belleville, Ontario in a nursing home. Margaret recalls one exciting time and having to remain out of her home during the Mississauga train derailment in 1979. When Margaret’s own health declined, she moved her aging sister from Belleville to Albion and Islington, Toronto so that they could be closer, and where Dorothy stayed until her passing. Margaret will be remembered by distant relatives, friends, neighbours and care givers. Burial of ashes to take place on Saturday, May 11, 2019 at 12 p.m. Donations are being accepted for: HILLCREST CHRISTIAN CHURCH (DISCIPLES OF CHRIST). Consider providing a gift of comfort for the family of Margaret Miller by sending flowers.